This month we will shine our spotlight on Ravi Jaya, the owner of one of our outstanding business units. As well as a strong history of providing excellent customer service, Ravi has an amazing positive energy and an efficient and passionate work ethic. I like drawing, art, playing the piano, swimming and going for walks with my family. I always like to be happy – it’s good for me and it helps others as well. I am a Business Unit owner and I manage a number of teams across six sites in Melbourne. Working with Danihers has allowed me to develop my cleaning and management skills and I am now a day green cleaning specialist. Each day I try to get around and visit most of my sites for a general update and to check the quality and cleaning standards. I love to see my teams and meet with the clients to discuss day to day needs and respond to any requests. I have had several customer service positions, including working as a Dairy Manager at Coles and as a Rep at Yakult Australia. Firstly if I wake up in the morning that makes me so happy 🙂 It means nature has given me another day to enjoy. I take every day as a good day. I believe it’s all about attitude – it’s how you take it and how you plan it. Unexpected things happen but it’s not the end of the world. Think positively and carry on… We spend most of the day at work so it’s important to have a good work environment as well. I like to have happy staff, happy clients and so on… I believe it all comes together to make our life easy and happy. I’m so lucky to have them all most of the time. Oh it’s hard to say… honestly my bed and pillow! I can shut down my mind a bit and relax for few hours. As an individual I would like to go to a body and mind relaxation place for couple of days. As a family I’m happy with anything that my wife and kids will enjoy. 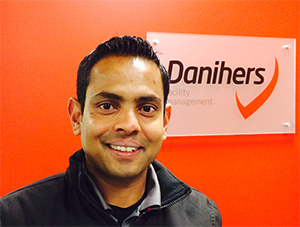 Working with Danihers I’ve learned lots of things when it comes to cleaning, as well as overall business and management skills. The support from Charlie, Maria, Steve and the team has been fantastic. Christmas time. It’s nice to get more time to spend with family and friends. Also wherever you look, people all around have the same happy spirit. It’s a great business to work with! They respect everyone in the same way. The management team and staff are very friendly and helpful. I especially love the family day where my team and other business units get together for a great day with our family and friends.